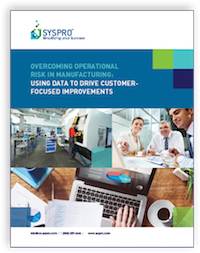 In case you missed our recent webinar, Conquering Operational Risk—Aligning Operational and Customer-Centric Approaches which was hosted by Manufacturing Automation and presented by SYSPRO Canada, you are invited to watch the video on-demand. View the archived recording as SYSPRO Canada’s Vice President of Sales, David Doyle and special guest presenter, industry expert Jonathan Gross from Pemeco Consulting, share their insights into how companies are using ERP projects to tighten their supply chains, improve their customer fulfillment metrics, and minimize operational risk, in this exclusive event designed specifically for manufacturing leaders. Hear first-hand how world-class organizations have overcome operational risk pitfalls and improved their businesses’ bottom line. 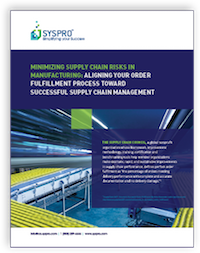 If you are manufacturing leader looking to improve your own organization's bottom line, this is a must view video. Don't miss out. View On-Demand Video Now.